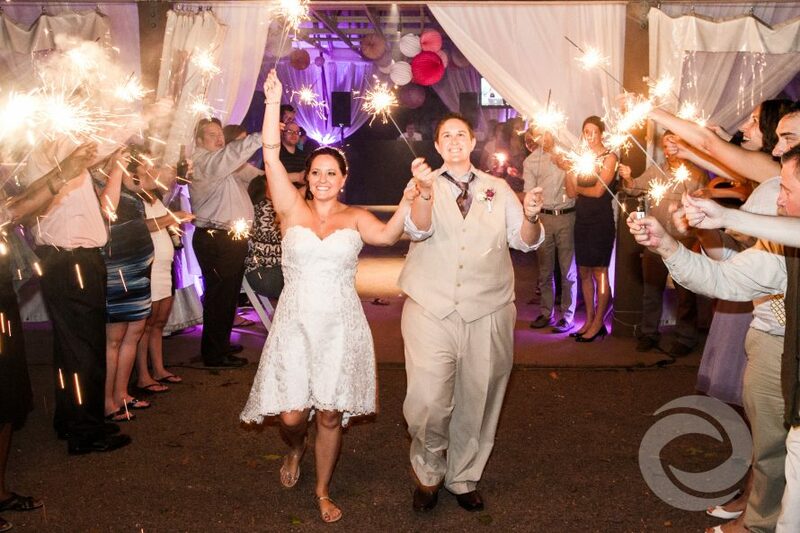 There's nothing quite like a sparkler send-off to bookend a fantastic wedding reception. Think about the typical end of a wedding reception. The music stops, the lights come on, and in an instant, the mood and the magic of the evening comes to a screeching halt. Guests slowly shuffle off the dance floor, gather their things, and mill around the venue saying goodbyes and having last-minute conversations. It's a pretty anticlimactic way to finish one of the most exciting events in a couple's life. One way to end your wedding on a high note is to incorporate a sparkler send-off. Before you and your new spouse leave your reception, have your friends and family line up outside your venue with sparklers. Once the sparklers are lit, your guests can raise them above their heads to create a pathway to your first night as newlyweds. This allows you to keep up the energy and excitement of the evening, and give your guests something big to talk about on their way out. Whether you choose to close out your wedding with sparklers or a different way, you'll want to have your videographer there to document it. What better way to end your wedding video than with the special send-off? Hurricane Productions captures and edits wedding moments, including sparkler send-offs, into a beautiful, artistic compilations. Contact us or request a quote to learn more about our services and pricing.